Phyllodes tumors (from Greek: phullon leaf), also cystosarcoma phyllodes, cystosarcoma phylloides and phylloides tumor, are typically large, fast-growing masses that form from the periductal stromal cells of the breast. They account for less than 1% of all breast neoplasms. 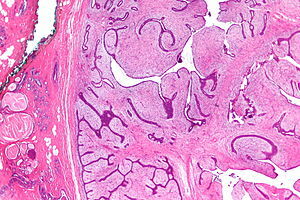 Micrograph of a phyllodes tumor (right of image) with the characteristic long clefts and myxoid cellular stroma. Normal breast and fibrocystic change are also seen (left of image). H&E stain. Anatomopathological results of phyllodes tumor. This is predominantly a tumor of adult women, with very few examples reported in adolescents. Patients typically present with a firm, palpable mass. These tumors are very fast-growing, and can increase in size in just a few weeks. Occurrence is most common between the ages of 40 and 50, prior to menopause. This is about 15 years older than the typical age of patients with fibroadenoma, a condition with which phyllodes tumors may be confused. They have been documented to occur at any age above 12 years. Phyllodes tumors are a fibroepithelial tumor composed of an epithelial and a cellular stromal component. They may be considered benign, borderline, or malignant depending on histologic features including stromal cellularity, infiltration at the tumor's edge, and mitotic activity. All forms of phyllodes tumors are regarded as having malignant potential. A large series from the M.D. Anderson Cancer Centre reported the incidence of each as benign (58%), borderline (12%), and malignant (30%). Malignant phyllodes tumours behave like sarcomas and can develop blood-borne metastases. Approximately 10% of patients with phyllodes tumours develop distant metastases and this can go up to 20% in patients with histologically malignant tumours. The commonest sites for distant metastases are the lung, bone, and abdominal viscera. Rare sites of metastasis like to parotid region have also been described. They are classified as a fibroepithelial tumor by ICD-O, but not by MeSH. Younger women have a higher chance of having a benign phyllodes tumor. The common treatment for phyllodes is wide local excision. Other than surgery, there is no cure for phyllodes, as chemotherapy and radiation therapy are not effective. The risk of developing local recurrence or metastases is related to the histologic grade, according to the above-named features. Despite wide excision, a very high percentage of surgeries yielded incomplete excision margins that required revision surgery. Radiation treatment after breast-conserving surgery with negative margins may significantly reduce the local recurrence rate for borderline and malignant tumors. The authors of a 2012 study have derived a risk calculator for relapse risk of phyllodes tumors after surgery. Phyllodes tumors are considered to be on a spectrum of disease that consists of fibroadenoma, fibroadenoma variant and benign phyllodes. Some would extend the spectrum to include malignant phyllodes tumors and frank sarcoma. ^ a b Tan BY, Acs G, Apple SK, Badve S, Bleiweiss IJ, Brogi E, Calvo JP, Dabbs DJ, Ellis IO, Eusebi V, Farshid G, Fox SB, Ichihara S, Lakhani SR, Rakha EA, Reis-Filho JS, Richardson AL, Sahin A, Schmitt FC, Schnitt SJ, Siziopikou KP, Soares FA, Tse GM, Vincent-Salomon A, Tan PH (2016). "Phyllodes tumours of the breast: a consensus review". Histopathology. 68 (1): 5–21. doi:10.1111/his.12876. PMC 5027876. ^ Moffat CJ, Pinder SE, Dixon AR, Elston CW, Blamey RW, Ellis IO (1995). "Phyllodes tumour of the breast: a clinicopathological review of the thirty-two cases". Histopathology. 27 (3): 205–18. doi:10.1111/j.1365-2559.1995.tb00212.x. PMID 8522284. ^ Sivaram, P.; Jayan, C.; Sulfekar, M. S. & Rahul, M. (2015). "Metastatic Malignant Phyllodes Tumour: An Interesting Presentation as a Parotid Swelling". New Indian Journal of Surgery. 6 (3): 75–77. ^ a b Guillot, E.; Couturaud, B.; Reyal, F.; Curnier, A.; Ravinet, J.; Laé, M.; Bollet, M.; Pierga, J. Y.; Salmon, R.; Fitoussi, A.; Breast Cancer Study Group of the Institut Curie (2011). "Management of Phyllodes Breast Tumors". The Breast Journal. 17 (2): 129–137. doi:10.1111/j.1524-4741.2010.01045.x. PMID 21251125. ^ Barth RJ Jr; Wells WA; Mitchell SE; Cole BF (2009). "A prospective, multi-institutional study of adjuvant radiotherapy after resection of malignant phyllodes tumors". Ann Surg Oncol. 16 (8): 2288–94. doi:10.1245/s10434-009-0489-2. PMC 5053421. PMID 19424757. ^ This is available at www.phyllodes.com. Tan PH, Thike AA, Tan WJ, Thu MM, Busmanis I, Li H, Chay WY, Tan MH (2012). "Predicting clinical behaviour of breast phyllodes tumours: a nomogram based on histological criteria and surgical margins". J Clin Pathol. 65 (1): 69–76. doi:10.1136/jclinpath-2011-200368. PMID 22049216. ^ Deen SA, McKee GT, Kissin MW (1999). "Differential cytologic features of fibroepithelial lesions of the breast". Diagn. Cytopathol. 20 (2): 53–6. doi:10.1002/(SICI)1097-0339(199902)20:2<53::AID-DC1>3.0.CO;2-T. PMID 9951596.